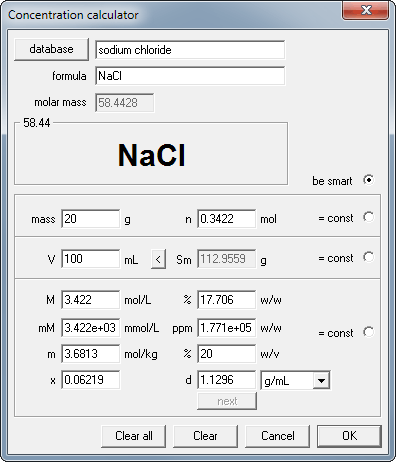 What are percent concentration and molarity of solution if 20g NaCl were dissolved and filled up to 100mL? What is the density of this solution? Question is tricky - final mass of solution is not known, mass of water added is not known and final solution density is not known. It is not easy to find out correct answer by hand. Let's try concentration calculator. Concentration calculator is used for both concentration conversion and concentration calculations. Start it using tool bar or View menu. Click on the substance button to open database window. Select sodium chloride from the list and click on Use button. Enter 20 into mass edit field and 100 into volume edit field. Ready! Lower part of the dialog window contains answers to all questions asked. Solution concentration is 17.7% or 3.42M and its density is 1.13 g/mL. For concentration conversion it is enough to enter known value into corresponding edit field. Check out this concentration conversion example. 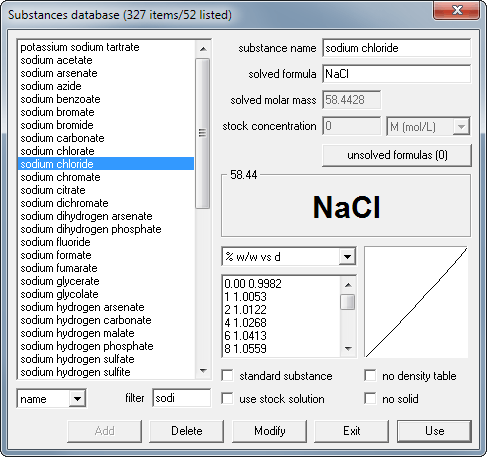 Conversion between concentration and density is done automatically for the substances with density tables present in database. If there is no density table, conversion is done assuming density of 1 g/mL or using entered value. The calculator is very flexible - for three values describing the solution (amount of substance, amount of solution - by mass or volume, concentration) it will calculate any unknown if two other values are given.